Did you know that nearly 50% of all our food waste is from the homes? Most of this can cost a family on average £480-£680 a month which can be around £50 a month. Two of the main reasons we throw food away is not using it in enough time and preparing too much to begin with. 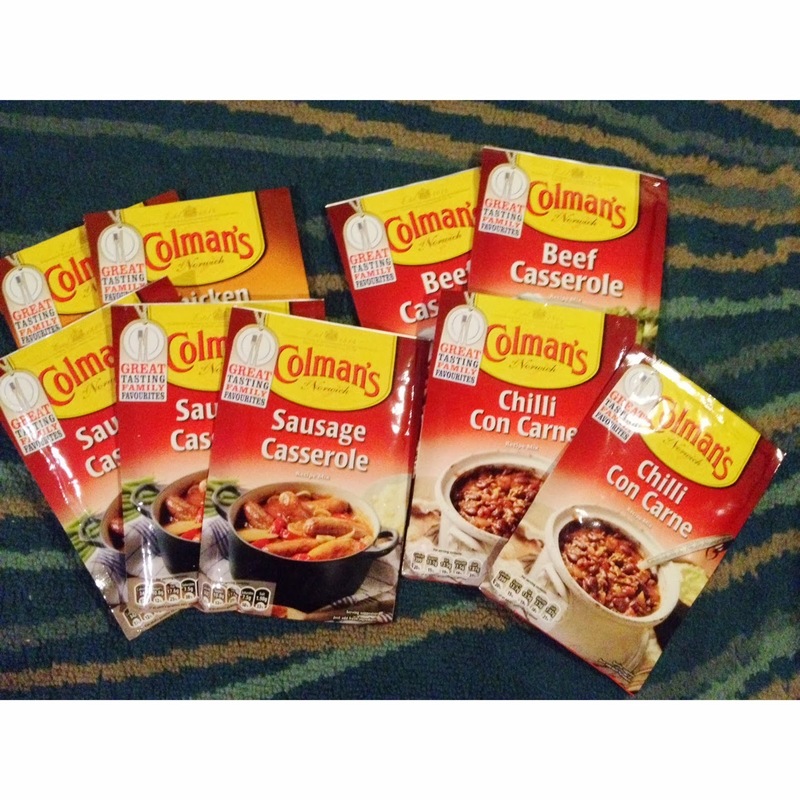 Colman's have set a group of bloggers a challenge to cook meals using their packet sauce mixes and batch freezing some so that it can be enjoyed twice! We got sent: Chicken Casserole, Sausage Casserole, Beef Casserole and Chilli Con Carne. In our family we love to use our slow cooker as I manage to cook it throughout the day and the family is free to eat when they are hungry. This is better for us as I work most evenings and we don't want to keep Max up to eat as a family. The only problem was that we always forgot to freeze some and then ended up throwing the majority of it away. We are great with meal planning but not so great with conserving the leftovers. We either pick at them or forget altogether. Because we were moving house between the two weeks we realised that it would be the perfect opportunity to freeze up some portions so that we had some to eat when we were at our new place. The first one we used was the sausage casserole mix. We added some sausages, potatoes, mixed veg and two packets of the sauce to make enough for two batches. Letting one half cool we wolfed down the other half with thumbs up all round. Max even went back for a second helping! After freezing the second batch, we defrosted it and cooked it up with some yorkshires and made it into a mini roast. Perfect to make the place feel like home. Next up we used the chicken casserole mix. Adding chicken breasts, thighs as well as veg we let it roast in the slow cooker all day with two packets of sauce mix. To serve it I added some rice which combined with the sauce gave a risotto type feel to it. The guys seemed to love it and I really enjoyed cooking something that was different to a regular roast. With the leftovers we made it into a chicken bake by adding pasta, fresh herbs and a sprinkling of pasta. Scrummy can't even describe how good it was! We then did the chilli. Chilli is a big deal in our house. We love it so much. We decided we had experienced a bit of a meat overload so used Quorn mince instead as we find it a lighter alternative to mince itself. As well as the mince we used a tin of five beanz, pasatta and some veg and then served up with a mix of quinoa and rice. One thing we did find was that the sauce was far too spicy for Max so we had to take the taste down with sour cream and more tomato. For me and Scott it was perfect though. We freezed it and then used the leftovers to make sloppy joes. Adding the mix to fresh baked burger buns (gluten free for me) and homemade wedges on the side. Definitely the best. We're yet to use the beef casserole. We felt we had gone a bit overboard with the casseroles for the fortnight but look forward to trying it in the next week or so. Colman's packet sauce mixes are perfect for creating food in bulk as you can double up or half the packets easy to create the desired amount. As with all foods it's advisable to let the food cool completely before freezing and adding a date on there so you know when to use it by (3 months at most). We defrosted all of ours by leaving it in the fridge for 24 hours so that we knew it was fully defrosted. We aren't too trusting of our microwave. But it was no problem as it meant that we used a meal plan to it's potential. Now we try and conserve as much food as possible. The foods that do end up getting thrown out are normally the ones Max has half chewed before realising he really didn't want that. Unfortunately living in a flat means we can't look into things like composting but it's something that we've been researching more and more. We also are looking into other meals and foods we can prepare and cook in advance and freeze batches of. We found that we spent less money as we planned what we were eating when and managed to save on buying those extra meals when other things went out of date! The money saved definitely made a difference, especially when moving is an expensive process. We also found that we had a healthy variety of dinners which I was really surprised about. Using the slow cooker meant that I spent even less time cooking. I normally prepare everything when the boys are eating breakfast so that it's perfect and tender by the time we eat later in the day. For more information about Colman's packet mix's click here. For more information about Love Food Hate Waste click here. Thank you to Mumsnet and Colman's for letting me take part. I'll be posting the recipes over the coming weeks in separate posts too! These look awesome! I'm going to show Mum to see what she thinks. We're the opposite with freezing though - we just forget it's in there and cook new stuff!